A slab of rotten flesh? Brilliant. 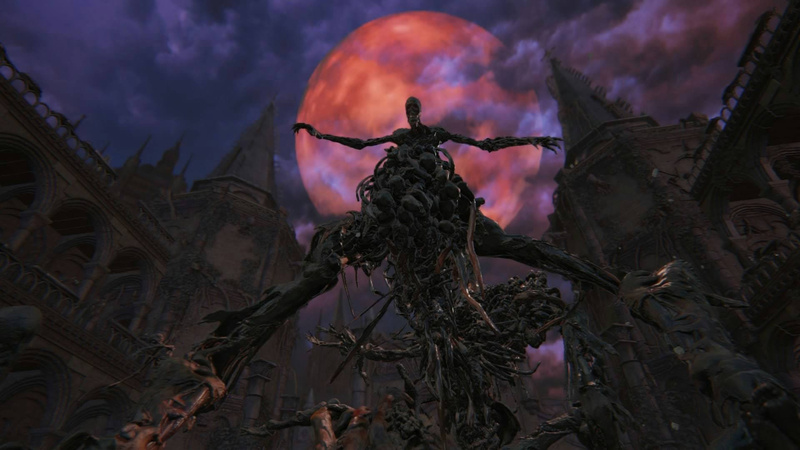 The One Reborn is seemingly Bloodborne's equivalent of the Gaping Dragon fight from Dark Souls, with casters raining spells from above and a foe that has a penchant for vomiting death around the entire arena. This'll be fun, huh? Luckily, One Reborn can be easy if played correctly. You'll encounter it as the finale of Yahar'gul Chapel, directly after an intense trek through the Unseen Village. As soon as the fight begins, head up onto the second floor and dispatch the Bell Maidens that will make it their goal to complicate matters throughout the fight. Once that's done, there's a decision to make: get rid of the casters or not? It's usually a good idea to just bite the bullet and remove this threat from the fight, allowing you to focus solely on the task at hand. Please note, though, that doing so enables the One Reborn to use a powerful area of effect attack from the head; the way that we're going to fight it should stop this from being any kind of real issue, though. Once that's dealt with take your weapon in two hands, imbue it with Fire Paper, and dive attack down to the boss (if you hit, this should cause a good amount of damage from the get-go). Make your way over to the back-end of the enemy, and once you're there go nuts. He'll get a few hits off occasionally, which can easily be healed up with quick use of the regain mechanic and popping Blood Vials indiscriminately – there shouldn't be any real risk of running out, so feel very free to use as heavily as required. Occasionally, One Reborn will rear up and begin to vomit, which is where things can begin to get really, er, messy if you're not prepared. As soon as you notice this, run for the hills – literally. This vomit causes consistent massive damage, and can very easily wipe out a player with even an exceptionally high Vitality stat in a matter of seconds, so the best course of action is to retreat until it clears and then head back in for some swift retribution. Once this mess is all mopped up, 36,300 Blood Echoes and three Yellow Backbones are yours. Treat yourself to three Insight for defeating it, too, as well as another for discovery. Have you flushed this foul beast down the toilet? Do you have any other tips to add on top of our own? Take out a sick bucket in the comments section below. As always wheb I saw the boss with so many blood echoes on me, I kinda panicked and didn't see the stairs. What I did was to run on him, trying to stay as close as possible and dodge the fires, to be honest I thought he was the easiest boss. @AFCC Sorry, we're trying to make these as discreet as possible and spread them out. In theory, as long as you don't click the article, there's just a tiny thumbnail and a name showing up on the homepage. @Sir_JBizzle Yeah, we will do, don't worry! @AFCC same here, gonna take break from Pushsquare. @get2sammyb why not have a separate guide section on the page, tag it with "spoiler" and release those guides "silently" into that section?! As I said in the other "article", I'm not a fan of the Spoilers. I'm not becoming a fan of this practice. I don't think you guys want to lose long time readers because of a few cheap hit articles, right? @get2sammyb one in particular had a strap line which gave away a large plot point. That's not cool. I appreciate that Bloodborne is a big deal, and I appreciate the guides as some of us may be having trouble. The thing is, the Americans had a head start on this, as it was released earlier, and many if us simply aren't up to speed. While I don't have a problem with the guides, please exercise caution when titling the articles themselves. This was the first boss that I beat on my first try.